The Republic F-84 was produced to meet a late WWII requirement for a pursuit aircraft capable of reaching 600+ MPH. Like most of the first generation of jets its service entry and performance was restricted by the engine it was powered by, and so was superseded by research data gained from captured German sources before it entered squadron service. By the time of North Korea’s invasion of the South many USAF units had taken on the –E model with improved performance. These joined the F-80s, several piston powered types and early Navy jets in the battle to stem the Northern aggressors with the premier type, the F-86A, staying at home. Despite some air-to-air successes the Thunderjets were outclassed by the communist's new weapon, the Mig 15. This necessitated the introduction of the Sabre into the theatre to get back air superiority. This saw the F–80s and F–84s switch almost exclusively over to ground attack. TheF-84Es were supplemented by new F-84G models, these were able to carry more ordnance and were the first single seat Nuclear capable aircraft, fortunately for all of us they never put that capability into play. 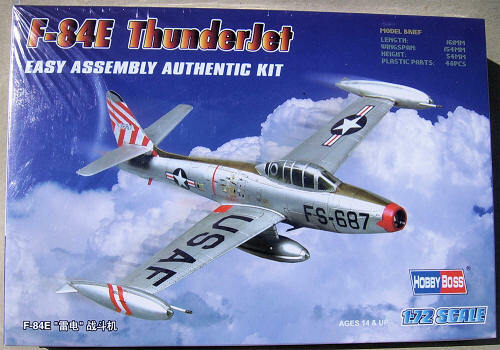 Hobby Boss have joined Heller, Tamiya and Academy in issuing a kit of the plank wing Thunderjet in 1/72. The kit is one of the entry-level series that is a bit different than your normal run of the mill injection molded kit. On opening the box you are confronted with what seems to be a partially constructed model in a black vacformed tray. The reason for that being the manufacturers method of reducing the number of parts to a minimum by forming the majority of the fuselage as one piece complete with cockpit as well as the upper and lower wing with a section of the lower fuselage. Most major parts are joined with large pins that make this almost a push together kit. Total parts count for this kit is 55, high for this series, several are optional or not used. Things under wings consist of 4 sets of rockets and a pair of drop tanks. The wings have part of the pylons for the tanks molded on and the holes for the rockets are already opened up. As far as molding flaws etc go there are excess pieces to be removed from the front U/C, tank pylons and the rockets and a seam that runs the length of the upper fuselage. Most other problems will be hidden after construction. Instruction sheet shows a 3-stage construction process with all painting details on the reverse side. This painting and decaling guide is on the crowded side with close inspection needed (in other words a magnifying glass for these old eyes) to see where the smaller decals go. Paint numbers are given for Mr. Colour and Aqueous Hobby Colour. 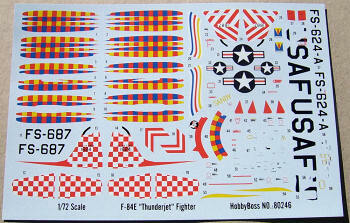 The decal sheet is as big as the box and gives 2 options: F-84E Sandy from the 9th FBS, 49th FBW Taegu 1951. F-84E flown by Col. Laven, CO of the 86th FBW in Germany 1951. These decals look good on the sheet and are well printed and include plenty of stencil markings. The under wing markings will need to be applied before the rockets, this is not mentioned in the instructions. All in all, this looks to be an excellent attempt at a –E model. 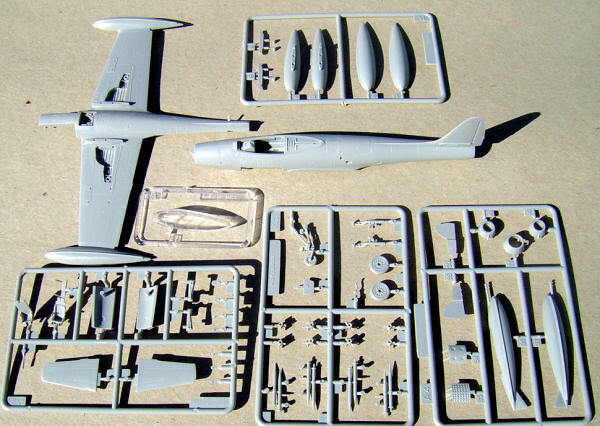 Some will view the way the parts are molded as a hindrance but this kit should be welcomed by newcomers and those with many kits under their belt.